When a child is born, it has only 22 partially developed bones in its feet: baby’s feet are a mass of cartilage, which develop as they grow until their late teens, when they have 26 fully developed adult bones. With so much physical development taking place in our early years, it’s little wonder foot health is so important for babies and young children. As with most other aspects of looking after a newborn, some of the best advice is to keep their feet clean and dry. Here are some of our top tips for caring for your baby’s feet during its early months. Wash your baby’s feet daily with gentle soap and, most importantly, dry the feet carefully afterwards. Focus especially on the gaps between the toes and around the toenails – as in adults, this area can be a breeding ground for bacteria if left moist. Although tiny, baby’s toenails that are left to grow too long can damage their super-soft skin when kicking or playing with their feet. You can buy specific baby nail clippers to help get the job done easily and quickly, without any harm or pain for the little one – and as little stress or concern as possible for you. As with adult toenails, trim them straight across leaving no rough edges. Those typical baby movements of kicking, bending their legs and flexing their feet are all part of normal development, so are to be encouraged. Keeping your baby active with activities such as baby yoga classes can help aid their development and muscular strength. No need to overdo it though, you’ll know when they’ve had enough! Put socks on your baby’s feet if it’s cold. Feet are an important part of body temperature regulation; if your baby is too cold, it can result in a range of issues, such as difficulty sleeping or reduced appetite. This can be easily overcome by popping a pair of socks on. Make sure the socks fit properly – babies grow quickly, so check regularly that you can comfortably slip your finger down between the ankle band and your baby’s skin without much pressure. Avoid hard-soled shoes until your baby is walking outdoors – tiny versions of fashionable shoes can seem like a cute idea, but there’s no need to put babies in shoes. Poorly designed ‘fashionable’ shoes can actually cause developmental damage, so stick with socks and soft booties. The time will of course come around. The College of Podiatry estimates babies will take their first steps between the ages of nine and eighteen months, and has great tips for choosing that all-important first pair of shoes. At Feet By Pody, age isn’t an issue – we see patients from the very young, to the elderly. 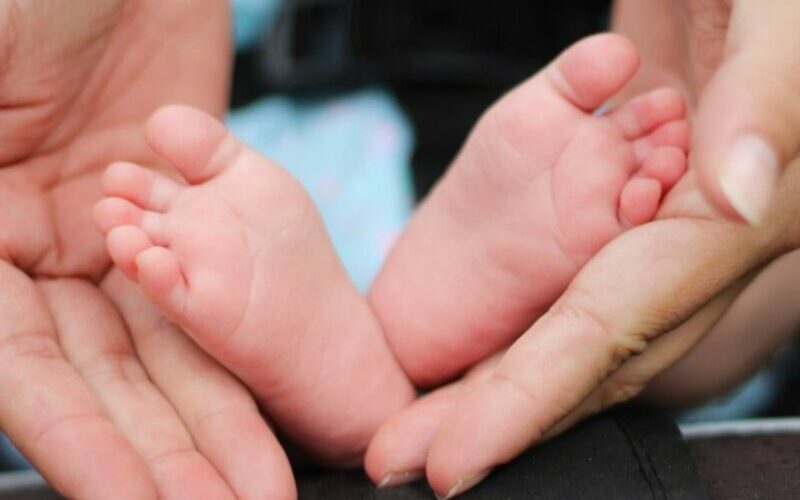 If you have concerns about your baby’s foot development or general foot health, contact one of our friendly London-based teams today, to book an appointment or see how we can help you and your little one.